Saisa Willis, president of BSU, has been a member of the union since it was renewed. Photo by Chloe Carlson. I was scoping out rival college news websites when I stumbled across a video piece in the Daily Bruin. It was about a famous black alumnus, Jackie Robinson and his contributions. Ideas were bounced around and played with until our group decided to do a recap of the Black Student Union’s (BSU) last two years, since they’re still establishing themselves. My team members, Veronica Fregoso (Editorial), Chloe Carlson (Broadcast) and Julia Morris (Multimedia) all supported the project. Turns out, this wasn’t the first senior project done about BSU. 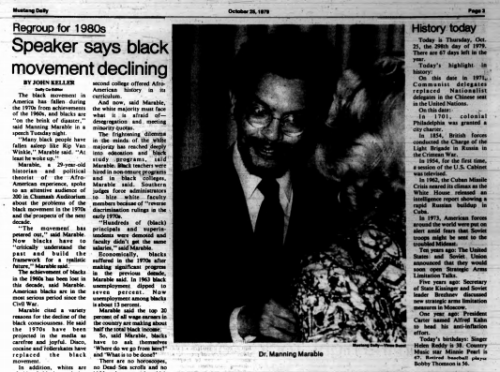 Carlson found a Mustang News article from two years ago about BSU when they first renewed their charter. Immediately we were challenged to find a different angle for this story. And that was just the first obstacle. 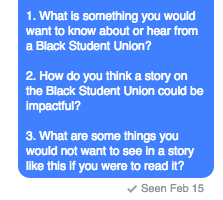 I went around to people on campus and Facebook just to see where interest was before we delved into the story. Most subjects were open and friendly about the topic and shared what they’d like to find out. 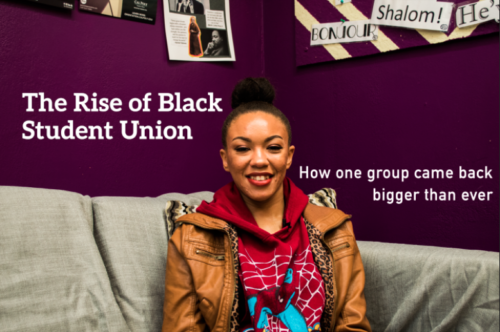 I knew a story about BSU was important when Kiana Dyson, computer science sophomore who is african american, had no idea the group existed. “It would be nice to know there’s resources and support out there for me to feel included,” Dyson said. Yet one student was not as responsive with the engagement. I messaged this student since someone on Facebook referred me to him. But he never responded. To have a source not trust you and talk to your superior was definitely a first and prepared us for future similar obstacles. There was more of this unresponsiveness as the project when on, but there was still hope. After all, if Gay Talese could write a famous profile on Frank Sinatra without getting to interview him we could make this story happen right? Carlson decided to take the story and put it into historical context. She dived into ASI data and old Mustang News archives to see how the club’s presence on campus changed throughout the years. Through this she has decided to make a timeline for the piece using old photos from past stories. Luckily we didn’t have to pull a Talese and ended up interviewing several people. Saisa Willis, our main source, is the president of the student union and has been involved since it started again two years ago. “I spent a year and a half thinking I was the only black student on campus,” Willis said in an interview. This story affected all of us differently. For Morris, it was admirable. “From interviewing the BSU president Saisa, I found it really inspiring how much the BSU has grown in just the last two years. They started with only three or four students coming to their meetings to now having 60-70 people showing up. I think that shows that there really is a need for that community on our campus,” Morris said. Carlson’s views were only further fortified as we did more research on BSU. “I have attended the Black commencement since I was a freshman because I was invited by my close friends. It’s true that BSU has grown because I see how it has impacted my friends who used to feel like they were alone on campus. Neat experience to hear from the people behind it all.,” Carlson said. For Veronica the story touched closer to home than anyone could have anticipated. “I found that this whole experience to affected me personally. As someone of color, it upsets me that I don’t see more representation of minorities and the amazing things they achieve at Cal Poly. Traditionally, underrepresented students have a different background and so it’s amazing when we get accepted to universities. BSU has made so much progress on campus in only a few years and the majority of the campus should respect organizations on campus like BSU because these are the clubs that are really changing the campus climate and making everyone feel welcomed and valued,” Fregoso said.